Family friendly, cozy cottage, in midst of Cayuga, Seneca Wine Trails. 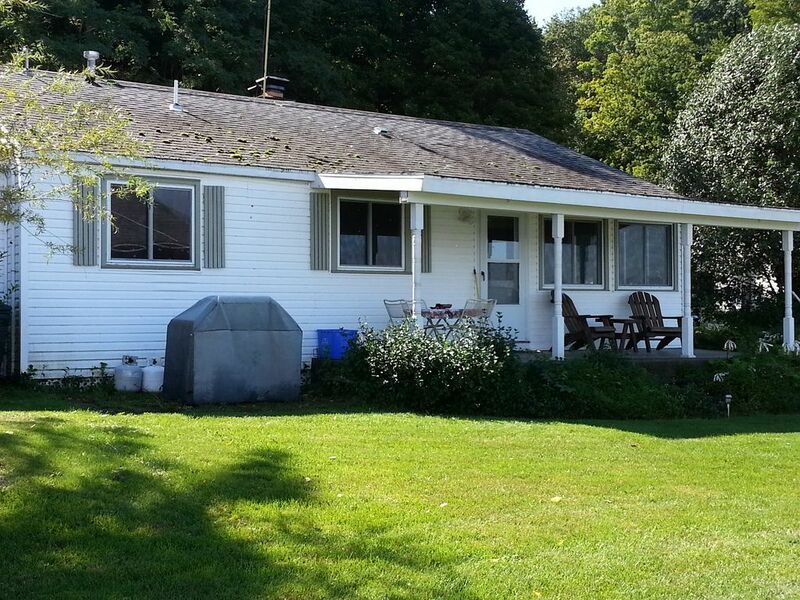 Very clean, ranch style cottage, completely winterized, at the lake level with no steps. Drive to the cottage on paved road, well maintained by the town. Park right next to the cottage. Winter is no problem, the town plows early and frequently if needed.On the west side of Cayuga Lake with spectacular sunrises if you are an early riser. Located midway up the lake on the west side, 18 miles N of Ithaca. 4 bedrooms, 1 with a queen sized bed, 2 have double beds and 1 has 2 single beds. Reading lights near all beds. Maximum 8 persons unless previously approved by owners. Large well equipped updated kitchen , big dining room overlooking the lake, large stone fireplace in living room, nice yards, porch with chairs and round table for eating, gas grill, historic gazebo next to the lake with 2 swings, as well as a large dock with a nice beach for swimming. Quiet residential neighborhood - no large gatherings permitted, again, unless previously approved by owners. Two weeks open for Summer 2019. We will begin begin taking actual reservations on January 1. The reason for this is we give the folks who come in the summer first chance to return the following year. Large bathroom, tub with shower, plenty of towels, individual cubbies. Trumansburg, a quaint little village with many unique shops and restaurants 8 miles away. Property is right on Cayuga Lake frontage, no steps down to it. There is a nice big dock right out the front door, next to the historic gazebo with swings to enjoy the view. No land line, AT&T cell service excellent, Verizon - fair. Next to house. Town maintained road to past the driveway. Plenty of on site parking. Plenty of bath towels, but no beach towels. New 2017 with 4 radiant elements, oven with broiler, self clean. Fully equipped, new electric range, refrigerator, new Bosch dishwasher (ultra quiet), microwave, coffee pot, all kinds of utensils, and cutting boards. Empty cupboards to store your own staples. Many paperbacks. Leave one, take one. Large lawn area for seating, games etc. Front (lake side) and back. Available for rent in the summer, 2 miles away. No boat but contact owner for mooring capabilities. Large dock with new boat lift. Kitchen completely updated - see pictures, with all large appliances, stove/oven, refrigerator/freezer with icemaker, microwave, dishwasher and many small appliances, ie coffee maker, blender, etc. Large dining room table, seats at least 8 and overlooks Cayuga Lake. Washer/dryer on premises, large screen HDTV with satellite, dvd/vcr player, cd player with stereo, and gas grill, patio furniture. There is a large dock with mooring whips to tie up a boat. The shore is gradual for excellent swimming in a huge, 40 mile by 3 mile lake pool called Cayuga Lake. Owner furnishes linens and towels, all you need to bring is your own food and clothes! Wi-Fi available and free. My girlfriends and I loved this house for our fall getaway! This house was perfect for us, it is close to many wineries, breweries, and distilleries. While we had some chilly weather the lake front location was so peaceful, the home has such amazing views perfect for viewing sunrises and sunsets. The house was clean, well maintained, and just right for the 6 of us. Paul and Maxine are so incredibly friendly, and quick to respond when we had any troubles or questions. We are already considering this cottage for another trip! Very close to Ithaca College and in wine country, my daughter and friends selected this house for a birthday week on the lake. It was perfect. Dock fishing, singing around the campfire, and cookouts were just what this happy group of millennials wanted. Gracious hosts the Flaggs addressed all pre check in questions quickly and were available during the week too. It's a beautiful spot to rest and relax yet close to other activities. Thankful for a happy week. Hope to be back sometime! We are happy when our guests are happy!! Thanks for the very gracious review! Perfect for our fishing crew of five! Great place, boat friendly and the owners are great people and very accommodating. Fishing was outstanding as well! Thank you Glenn for your great review! We certainly enjoyed having you and your fishing buddies, and are especially glad the Lodge met your expectations! You left the cottage in great condition, which we certainly appreciate. We can't wait for you to come again, as you are welcome any time. Up for a college graduation weekend, this was a great way to have multiple generations of family staying together. We were sad our time in the cottage and being lakeside was so limited, but were so glad to have a welcoming and relaxing place we could all spend time together. Paul and Maxine were understanding of all our comings and goings and checked in on us to make sure we were set for the weekend. The cottage was extremely clean and orderly as well. Location was great as we could visit a vineyard and gorges and it was a straight shot down to Ithaca. Thanks so much for having us! Thank you for your very kind review! We do take great pride in having a clean welcoming cottage in a family setting so that folks have nothing to worry about or do except having a great time. We certainly enjoyed having your family next door and are so happy you were appreciative! We hope to see you again at some point in time!! Lovely little cottage with stunning lakefront. Great for kids, and close to several wineries. Very friendly owners who are helpful. Thank you so much! We do love our spot on Cayuga Lake with no steps to the water, near wineries and so much else. Basically, we love to interact with renters, but never want to be intrusive. Many have become personal friends over the years, but enjoy letting renters enjoy their private, personal space. Most of all, it's your vacation to enjoy! New week has become available! Friday,July 20,2018 until July 27,2018! This doesn't happen very often, so grab it while you can!! Respond asap to have this week be yours!! Calendar is up to date. Located in the heart of the Cayuga Wine Trail, the nearest (Lucas Vineyards) 1 mile away, and 20 minutes from the Seneca Wine Trail. Many nice restaurants are associated with the wineries. Two great golf courses 10 minutes away. Many activities in Ithaca associated with Cornell and Ithaca College, Hangar Theater and other theaters, close to many state parks with beautiful gorges, Taughannock State Park is only 7 miles away, hiking trails, nature centers near by. Extraordinary and huge Ithaca Farmer's Market is 1/2 hour away, with many local produce stands nearby. All water activities can begin at your doorstep if you have the equipment. Paddleboats, kayaks, canoes, paddleboards are available to rent 2 miles away. Cornell Plantations and Ornithology Lab within a half hour. Tours available most times of the year. A National Forest is 20 minutes away with many hiking trails. Cayuga Lake is perfect for all water activities, swimming, sailing, canoeing, kayaking, etc. Start here for your fall foliage tours! In the winter, downhill ski center 1 hour away, many cross country ski trails nearby. Shopping at Prime Outlets 30 minutes away, with several antique and craft stores in the immediate area. Several great restaurants nearby or in Ithaca. Del Lago Resort and Casino is approximately 30 miles away, easy drive, several wineries along the way. Contact owner for rates, for Christmas and New Years. $300 of 50% deposit due within 7 days to hold reservation, remainder of deposit due within 30 days. Full payment is due no later than 7 days before check in. The paved road leading to cottage is well maintained in winter so off season is a great time on the lake - a quiet get-away! Relax by the fire or go skiing!